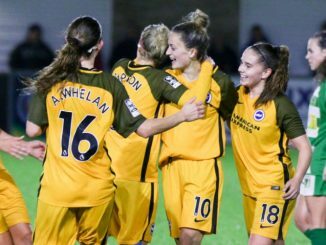 Birmingham withstand Everton fightback, Brighton overcome dismissal to defeat Durham, Spurs secure their first ever WSL points, Millwall retrieve two-goal deficit at Doncaster, Oxford go top of WSL 2 on goal-difference. Two goals to the good at half-time, Birmingham City conceded seconds after the restart but visiting Everton were unable to find an equaliser. Birmingham City took the lead on 14 minutes through Ellen White and Charlie Wellings finished off a team move to make it 2-0 shortly after the half-hour. 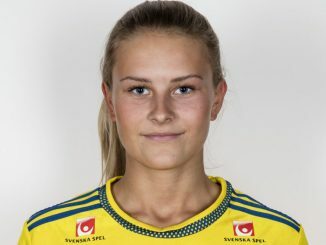 Within the first minute of the second half, Chloe Kelly marked her full Toffees’ debut by tucking the ball home past 16 year-old substitute keeper Fran Stenson. The visitors came close to a late leveller as Simone Magill forced Stenson to save, then 4 minutes into added time Paige Williams threw her body on the line to deny Courtney Sweetman-Kirk. Brighton threw away a two-goal lead and had their keeper sent off but won 3-2 with a late penalty. The Seagulls took just 8 minutes to score, as a long ball over the top found Fliss Gibbons, who cut inside and fired past Helen Alderson. The lead was doubled inside 30 minutes, Ini Umotong with an overhead kick that gave the keeper no chance. Durham halved the deficit on the stroke of half-time, as Zoe Ness sets Beth Hepple free to slot home. On 56 minutes, Albion keeper Lucy Gillett was sent-off for bringing down Nikki Gears when through on goal. Umotong was sacrificed for substitute keeper Chloe Samson but Hepple curled a free-kick into the bottom corner to level the scores. Brighton almost retook the lead soon after, Danielle Buet’s 25-yard effort striking the crossbar and then Alderson denied her from point-blank range. But when Caroline Dixon tripped Gibbons in the area, Buet buried the 82nd-minute penalty to give Albion a 3-2 victory. Doncaster Rovers Belles were another to let go a two-goal advantage, as Millwall went away with a point. Ashlee Hincks hit the Belles bar early on but it was the hosts who scored first, Rebecca Rayner bundling the ball home from Sarah Quantrill’s attempted punch clear. Leah Cowan forced a fine stop from Jules Draycott before the Doncaster got a second on 30 minutes, Rhiannon Roberts volleying in from Chloe Peplow’s free-kick. Millwall got a goal back at the end of the half, when Charlotte Devlin’s deflected effort beat Draycott. Quantrill crucially kept the Lionesses in it when turning a Christie Murray effort round the post and there was then an equaliser from Hincks with 3 minutes left, earning Millwall a point. Tottenham’s home bow in the league produced a goal in each half for the hosts, as they recorded a 3-0 victory over Aston Villa. Nineteen minutes into their WSL home debut, Tottenham took the lead against Aston Villa, as Bianca Baptiste’s near-post corner beat goalkeeper Sian Rogers and dropped into the far corner. Five minutes after the interval, Villa’s Beth Merrick was through on goal but Toni-Anne Waybne got down to make the save. Sarah Wiltshire cut the ball back from the byline for Wendy Martin, whose shot was pushed away by Rogers. 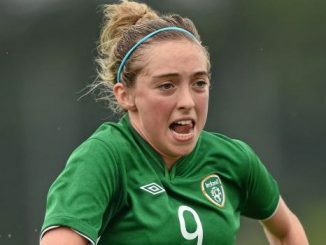 Merrick threatened again for Villa but saw her 30-yard strike come back off the post. Six minutes after replacing Baptiste, Lauren Pickett set up Coral Haines to double the advantage. Oxford United lead WSL 2 on goal-difference following a 3-1 success away at Watford. Watford keeper Fran Kitching held a stinging early effort from Emily Donovan but Oxford too a seventh-minute lead, as Danielle Carlton’s free-kick saw Hannah Short scramble the loose ball home. Kayleigh Hines made it 2-0 with a well-struck free-kick on 33 minutes but soon after Watford replied with a Sarah Jones header at the far post. Emily Allen intercepted Watford’s attempt to play out from the back and went through on goal to net a third for United on 78 minutes.